We are a top-notch organization engaged in manufacturing and supporting a compendious assembly of Bottom Discharge Centrifuge Machines. Under this array, we offer Three Point Bottom Discharge Centrifuge Machines and Four Point Bottom Discharge Centrifuge Machines. All these bottom discharge machines are precision-engineered and completely flawless as our professionals make use of supreme quality raw material and other components at our in-house sophisticated infrastructure in the manufacturing process. Our offered array is widely appreciated for various features a filtration of the product at different speed and inverter driver / fully auto control. 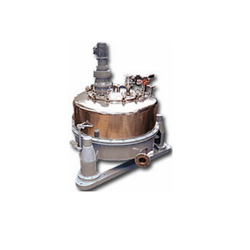 With firm commitment to quality, we are engaged in offering a flawless gamut of Four Point Bottom Discharge Centrifuge Machines, which is used for solid liquid separation. We manufacture these machines at our state-of-the-art-infrastructure using the premium quality raw material, sourced from the vendors of high repute, with the assistance of experts. Owing to our efforts, the offered machines are in-sync with globally laid quality standards and norms. 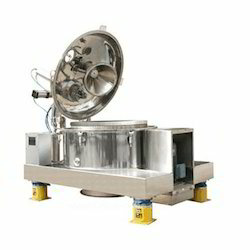 Understanding the requirements of chemical, pharmaceutical, food processing and beverage industries, we put forth a wide range of Three Point Bottom Discharge Centrifuge Machines. The offered machines allow are high in demand as these filter products at various speed. Moreover, these machines ensure no contact between the operator and the product, owing to which hazardous, toxic and allergic materials can be handled easily. We provide these machines to patrons in various specifications. Looking for Bottom Discharge Centrifuge Machines ?